The Center for Teaching and Learning (CTL) provides academic support for teaching and learning excellence at UCM. CTL offers many new development opportunities for faculty and administrators geared toward pedagogical advancement and educational innovation, as well as needed information and training on policies that affect them on a daily basis. 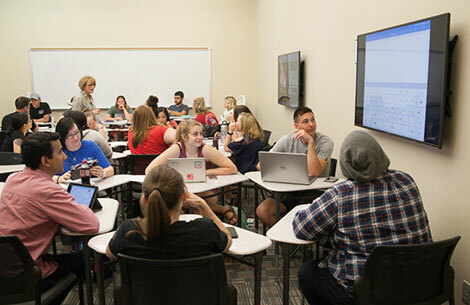 The scholarship of teaching and learning at UCM is supported through various activities, events and resources furthering lifelong learning for faculty and staff. In addition, faculty have opportunities to apply for funding to support travel to conferences, new multimedia equipment for classrooms, release time for research projects, and on campus speakers. The CTL offices are located in the James C. Kirkpatrick Library, suite 1440. For additional information, please contact us at 660-543-8528 or email at ctl@ucmo.edu. What's New in Teaching & Learning? We are combining the CTL and Library training offerings onto one calendar for your convenience. You can now simply click on the calendar link provided in the UCM Daily each Monday, or on the trainng titles provided in the Friday emails to go directly to the descriptions and registration links! We hope this eliminates some extra steps in planning your professional development and hope the calendar view makes it easier to see how the trainings fit into your week! Blackboard guidelines you can use as a checklist for ending your current Bb sections and beginning your next semester Bb sections. Grab the latest issue of our newsletter - Focus on Faculty - or catch up on all of the past issues you may have missed in our newsletter archive. Launched in Fall 2017, ALEC enables faculty to engage with innovative teaching technologies paired with pedagogical advancement in a real classroom environment. For more information, please visit the ALEC page. Due to ongoing budget challenges, the grant programs offered to faculty by the Center for Teaching and Learning have been adjusted. For more information, please review the grant opportunities being offered to full-time faculty. Download a PDF of the Course Planning Calendar for Spring and Fall semesters 2019.